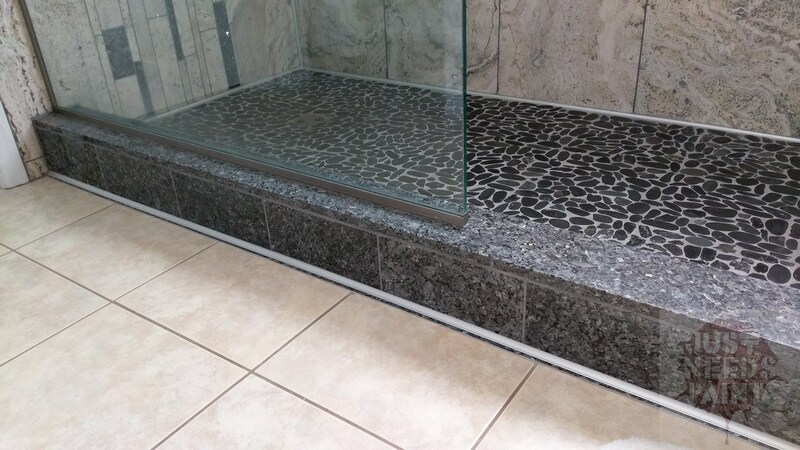 In this article we are going to talk about what exactly a shower curb is, different sizes, materials that can be used and the purpose of it. We are also going to talk about the benefits of having a shower curb and installation and the materials used for that. We will also be covering pre-formed vs. building your own and comparing the pro and cons of those topics. These topics will be broken down into their own categories so that it is easy to follow along. Let's get started. What is it exactly? Let's first start by saying it can have a few different names. It is knonw as a curb, barrier or dam in most cases. It is the barrier between your wet area and the bathroom or area outside of it. If you have a stand alone shower then you know what I'm talking about. It's the height difference in the floor that you have to step over to get in or out of the area. If you have one it's probably safe to say you may have stubbed your toe on it a few times over the years. It is used to keep your water in one central location and avoid getting the area outside of your shower soaked if you aren't careful. I know most of you are probably thinking who doesn't know what this is but you would be surprised how many questions we get on this very topic. Now that we have covered what exactly it is let's move onto the next section. It comes in a wide variety of sizes and shapes - the choice is yours. The TruCurb comes in four standard sizes. 34 inches, 48 inches, 60 inches and 72 inches in length. All of the TruCurbs are roughly 5 inches thick and 6 inches in height. Since the TruCurb is made of a high-density, lightweight, expanded polystyrene, it is easily trimmed to fit the rough opening size of a unique showering area. Most US codes require that a barrier be two inches above the existing drain in your wet area. While this code is not valid for all United States locations, it is valid in most. With that being the case your barrier could be very low so long as with the slope of your wet area it sits higher than the drain. While the TruCurb tray comes pre-formed and in only one shape, there are many barrier tiles you can achieve since the material is easily trimmed. It come in many different sizes and thicknesses. You can have an ultra-low profile barrier that may only be one inch in height. These types are often used when someone wants a walk-in wet area but is unable to achieve a complete curbless bathroom due to floor restrictions. Materials are an important part expecially if you are building your own barrier. There are several different types of material that you can use to create your very own unique barrier. Materials such as wood, cement, cement blocks, pre-formed polystyrene pieces or even solid pieces of a high-density plastic. Any material that you decide to use in your bathroom can be customized to your own unique space and shape. Pre-formed options come made of materials such as expanded polystyrene or Santoprene. We will talk more aboout those materials and what they mean for you in the next section of this article. There are several different types of curbs availabe from a wide variety of retailers. Some are made out of a high-density, lightweight, expanded polystyrene like the one provided by us and companies like Schluter. This type comes pre-formed in a elongated square with notches in it that allow for it it adhere stronger to the thin-set mortar. Next you have one that is newer to the market, this is the collapsable shower dam. It is made of made from a very durable and unique material called Santoprene. This type is designed for use in a ADA accesable wet area so that it is easy for wheelchairs to come in and out of the area easily. Other companies make what is called a curb overlay. This product is also made of expanded polystyrene (EPS) like other designs mentioned above but it is also coated with an acrylic polymer finish. This type of design is used to place over a 2"x4" wooden barrier that you build on site. These overlays can be purchased from companies like Noble and Laticrete. They can be made out of cement or cement blocks. Some barriers can even double as a bench on the inside of the showering area. It is very possible to have a barrier that gets higher and wider after a certain point. There are many different options and types available. Of course just like everything else, building things yourself allows you to create exactly what you want and need. It also allows you to create a very unique design. Say you want to have a rounded curb, or the one that comes out to a point in the middle. Building your own might be the best option to acheive this unique look. While there are pros to building your and desinging it yourself there are also cons. Taking on any project no matter how big or small requires preperation, research and design. If you decide to take on building your own barrier then you will need to decide what materials you want to use, how much you will need and how to make the structure sound and solid. If you are not ready or willing to put in all the work and do the shopping for materials then building your own barrier might not be the best option for you. This is where pre-formed barriers come in handy. Someone has already done all the caculations for you and most of the time all you need to know is your rough opening to ensure you purchase the right size. Having someone else do the majority of the work for you except for installing it (and even this sometimes is doen for you if you hire an installer) is definetly a pro. There are several different options available on the market and you can even have something custom built for you if you find the right retailer. With this of course comes price which can sometimes be a con. While your basic curb is not super costly and it won't break the bank, a custom design or a very large build can sometimes cost you a pretty penny. As you can see there are pros and cons to each option as with most everything else in life. It really comes down to presonal preference. The benefits of having one is that it can provide a base for mounting brackets for a showering door and also allows you to mount a sliding door to the curb as well, or to the outside for your wet area itself. It will also keep all of the water in one central location. This can be a definite plus if you have a baby or an animail and all you have is a single wet area. It also allows you to have a walk-in area without having to potentially alter your showering subfloor or your existing bathroom floor to achieve that low-profile look - that dream bathroom - while also still being very handicap accessible at the same time. There are many different benefits to having a barrier in your bathroom. These are just to name a few of them. Low profile barriers are still very easily installed and can be used to have a wheelchair go in and out of it...Walkers, canes and things of that nature. The TruCurb is made out of high-density, lightweight expanded polystyrene with constructional shower dams. Trucurbs are specifically designed to integrate the TruGard Standard TruSlope Center Drain trays, Standard TruSlope Linear Drain trays and the TruGard Vapor-Shield or Steam-shield waterproofing membrane system. 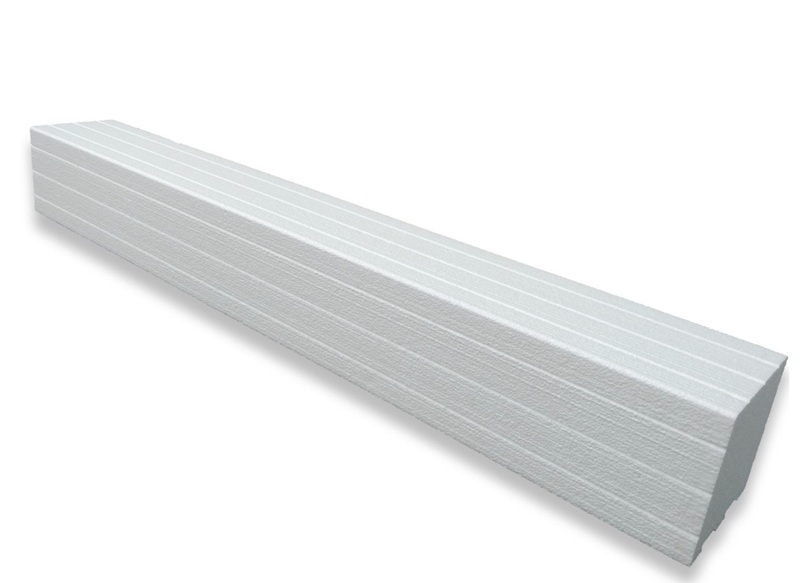 This type of barrier comes ready for installation and tile. The purpose of a barrier is more than just for aesthetic reasons. Sure they look good but they also serve a purpose. The reason of a showering barrier is to keep the water in your wet area in one central location. When it is used in conjunction with one of our TruSlope Standard Center Drain or Linear Drain trays, the water from your wet area stays inside and drains properly. Having a curb in place gives many people peace of mind that the area outside of their shower isn't continuously being saturated with water causing irreparable damage that may result in thousands of dollars in costly repairs. Many people worry about mold and mildew buildup so having this extra protection that separates the water from their bathroom floor helps them achieve that. While there are many different tile sizes are on the market and many different styles, the choice is yours as to how unique you want your showering area and it's barrier to look. We covered a lot of information in this article and we hope you found it helpful. Thank you for reading we hope you enjoyed it. For more like this one check out our other articles.